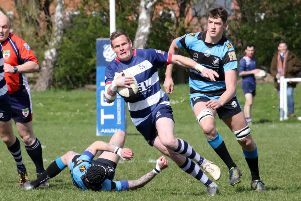 Banbury Bulls cruised into the last four of the Oxon County Cup with an impressive 48-14 victory over last season’s finalists Witney. A brace of tries from Ed Berridge and Sam Stoop helped secure Friday’s victory for the holders. The game started in horrendous conditions which continued throughout the game but that didn’t deter the visitors. Bulls won a scrum against the head and countered quickly, Stoop grubber-kicked the ball through and Jack Briggs dotted down in the corner. Bulls soon settled any early nerves with their second try. Duncan Leese forced a five-metre scrum. Bulls got the scrum rolling and Berridge touched down. Berridge soon had his second try of the contest after a break. Stoop threw a great pass that pulled the Witney line out of position and Berridge burst through to score with Ed Phillips adding the conversion. Bulls started the second half how they ended the first. Ken Key set up a rolling maul inside the Witney 22 and Phillips went over before adding the conversion. Bulls were in again after the restart, Stoop picked off a Witney pass, got the ball to Berridge and, as he was about to be driven into touch, he brilliantly off-loaded to Stoop who slid his way over. Phillips curled a neat conversion over before Witney went through several phases for Wayne Caffekey to crash his way over under the posts and Phil Thomas converted. But Bulls extended their lead with another try after winning a scrum against the head. Phillips passed to Stoop and the fly-half found his way through a gap in the Witney line to score out to the left. Phillips converted before Witney narrowed the gap when Carl Strut burst his way through the Banbury line to go in untouched under the posts and Thomas added the conversion. Bulls scored again when Stoop got the ball wide to Briggs who played in Tom Burman down the line to score in the left corner. In added-time, Witney failed to clear from the edge of their 22. Joe Mills beat one man before off-loading to Ian Isham who broke through and dived over.